Row 1: with pink ch 10, sc in second ch from hook, dc in next ch, 6 tr in next ch, dc in next ch, sc in next ch, dc in next ch, 3 tr in next ch, dc in next ch, sc in next ch, finish off. Row 4: sl st with pink joining yarn to last sc on row 3, ch 1, turn, sc in next sc, dc in next sc, 3 tr in next sc, dc in next sc, sc in next sc, dc in next sc, 6 tr in next sc, dc in next sc, sc in next sc, finish off. 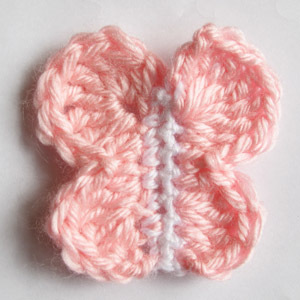 This entry was posted on Tuesday, March 27th, 2012 at 12:00 AM by Emilee Gettle	and is filed under Free Crochet Patterns. You can follow any responses to this entry through the RSS 2.0 feed. You can skip to the end and leave a response. Pinging is currently not allowed. If this was made using a larger hook and thicker yarn, would it just be a bigger version? This is beautiful! Can’t wait to try it. I only have worsted yarn, so I hope it will turn out ok. Thanks!